The man suspected in stealing the mural is described as 25 to 35 years old and last seen wearing a multi-colored T-shirt, black shorts and black sandals. 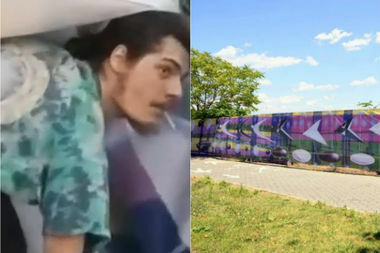 MANHATTAN — A $2,000 Kenny Scharf mural hung on an East Harlem fence was taken by a pair of suspects who loaded it into an SUV and drove away, police said. It was the second time a piece of art hung in the area was stolen, and this time the heist was captured on video. The 60-foot-long, 7-foot-tall Scharf mural had been put up at East River Park, at 517 E. 117 St., in July by the Friends of the East River Esplanade for a public art project. It was a part of an effort to improve the Esplanade that stretched through the summer months. The suspects swiped it at 8 p.m. on Aug. 20, police said. Another banner, hung by the group on 116th Street at FDR Drive, was stolen in June. Police released a photo and video of the man appearing to steal the mural from the fence. He is described as 25 to 35 years old and was last seen wearing a multi-colored T-shirt, black shorts and black sandals, the NYPD said. Police did not have a photo of the second suspect, who was described as a woman with blonde hair. The car used in the theft was described as a black or gray Honda Element. “These were double-braided steel ties. You had to really go with pliers, this is not like taking scotch tape off the wall kind of thing,” group member Jennifer Ratner previously told DNAinfo.